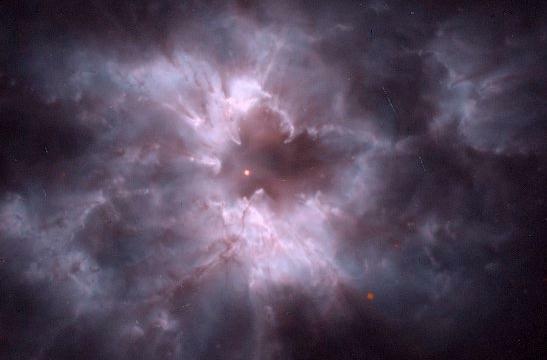 layers, like planetary nebula NGC 2440. WD 0806-661 is very dim white dwarf, stellar remnant located about 62.6 +2.0/-1.9 light-years (19.2 +/- 0.6 parsecs) away (Subasavage et al, 2009). It can be found only by telescope in the south central part (8:6:53.7-66:18:16.7, ICRS 2000.0) of Constellation Volans, the Flying Fish, originally called Piscis Volans -- west of Beta and Alpha Volantis, northwest of Miaplacidus (Beta Carinae), north of Epsilon Volantis, and northeast of Delta and Gamma as well as Zeta Volantis. The white dwarf and its relatively high proper motion may have been first found and published in 1949 by Willem Jacob Luyten (1899-1994), who found the proper motions of over 520,000 stars despite the loss of sight in one eye since 1925 by building an automated photographic plate scanner and measuring machine (Willem J. Luyten, 1949, No. 27 or L 97-3 in Table 1). In 2010, a ultra-cool companion object was found using NASA's infrared Spitzer Space Telescope and designated as WD 0806-661 "b", (Luhman et al, 2011a; PSU news release; NASA / JPL news release; and Jason Major, Universe Today, October 21, 2011). as the white dwarf WD 0806-661 (more). If confirmed to be gravitationally bound, the two substellar objects have a separation of around 2,500 AUs (130") and would have an orbital period of years if the system is around 1.5 billion years old (Luhman et al, 2011b; and Luhman et al, 2011a). WD 0806-661 "b" is extremely cool, possibly cooler than UGPS-0722-05, but its estimated mass is so low that it lies in the realm of Jupiter-class planets -- possibly cooler than CFBDSIR J1458+1013 b (Liu et al, 2011), another potential Y-dwarf discovered in 2010 (Luhman et al, 2011b; Ian O'Neill, Discover, March 12, 2011; and staff, New Scientist, March 12, 2011). WD 0806-661 is a white dwarf stellar remnant of spectral class DQ (formerly DC2), which exhibits strong atomic or molecular carbon lines (Luhman et al, 2011b). Its progenitor star may have been a spectral class A star with 2.1 +/-0.3 Solar-masses (Luhman et al, 2011a), which blew off its outer gas layers of hydrogen and helium and is now around 1.5 +0.5/-0.3 billion years ago (Luhman et al, 2011). WD 0806-661 has about 0.62 +/- 0.03 of Sol's mass (Luhman et al, 2011b), but with only around a few percent of its diameter (around the size of a planet like Earth), and a similarly small share of its brightness. White dwarfs are incredibly dense objects because they squeeze a stellar mass into a planetary volume. While tiny compared to main sequence stars, white dwarf stars are actually intensely hot, but without the internal heat of fusion to keep them burning, they gradually cool and fade away. Some alternative names and useful designation for WD 0806-661 are: GJ 3483, L 97-3, LTT 3059, and 2MASS J08065373-6618167. 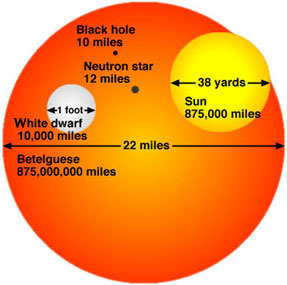 The observed number of white dwarfs in the Solar neighborhood comprises only about one percent of its dynamical mass density (Liebert et al, 1988), but most white dwarf companions in binary systems with bright, main sequence stars have not been detected probably due to their relative faintness and because of the glare from the primary star (James Liebert, 1980). A recent survey of 146 DZ white dwarfs and their "externatlly polluted atmospheres" suggests that at least 3.5 percent of white dwarfs may harbor the remnants of terrestrial planetary systems, while another study of 129 white dwarfs within 20 parsecs (65.2 light-years) of the Solar System suggests that at least one fifth (20 percent) have "photospheric metals" that may have come from accretion of circumstallar debris disks which may have eventually produced planets or asteroid-like bodies (Farihi et al, 2010; and Sion et al, 2009). All the known white dwarfs within 20 parsecs (65.2 light-years) of the Solar System appear to be members of the thin disk, as none exhibit kinematic properties of the halo or extended thick disk Sion et al, 2009). Brown Dwarf or Planet "b"
a white dwarf stellar remnant (more). Substellar object "b" has an estimated mass of only around seven Jupiter-masses (Luhman et al, 2011b). It appears to have an effective temperature of roughly 300 Kelvins (27 Celsius or 86 Fahrenheit) and so may be a member of the proposed "Y" spectral class for brown dwarfs (Kirkpatrick et al, 1999). 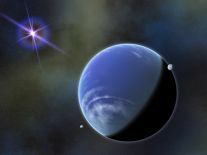 Despite its current separation from its primary of roughly 2,500 AUs which would suggest that the object formed as a brown dwarf separate from any planets orbiting the white dwarf primary, it is possible that the object originally formed closer to the primary within its circumstellar gas and dust disk but drifter into a farther orbit when the progenitor star blew off around three-fourths of its mass in a planetary nebula. (More from Luhman et al, 2011a; PSU news release; NASA / JPL news release; and Jason Major, Universe Today, October 21, 2011). bluer and so should be more magenta in hue (more). 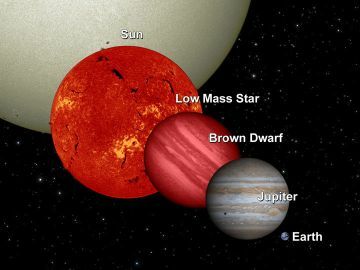 University of California at Berkeley astronomer Ben R. Oppenheimer, who helped to discover the other nearby brown dwarf, Gliese 229 b, is part of a growing group that would like to define a brown dwarf as an substellar object with the mass of 13 to 80 (or so) Jupiters. While these objects cannot fuse "ordinary" hydrogen (a single proton nucleus) like stars, they have enough mass to briefly fuse deuterium (hydrogen with a proton-neutron nucleus). 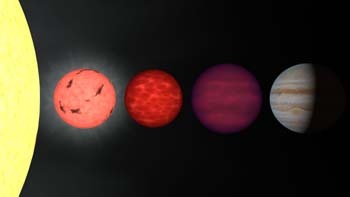 Therefore, stellar companions with less than 13 Jupiter-masses would be defined as planets. and radiate more visible as well as infrared light. 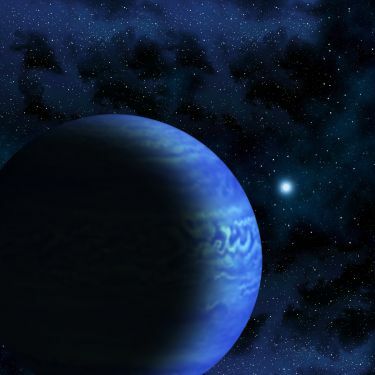 Up-to-date technical summaries on WD 0806-661 can be found at: Jean Schneider's Extrasolar Planets Encyclopaedia; NASA's PlanetQuest; and the SIMBAD Astronomical Database. Volans is a constellation of the southern sky, which represents a flying fish. Originally called Piscis Volans, it was one of 12 constellations created by Petrus Plancius (1552-1622), based on the observations of Pieter Dirkszoon Keyser (?1540-96) and Frederick de Houtman (1571-1627). Plancius depicted Volans on a celestial globe that was published with Jodocus Hondius (1563-1612) in Amsterdam around 1597 or 1598, and the constellation was later included in a celestial atlas by Johann Bayer (1572-1625)in his 1603 Uranometria. For more information about the stars and objects in this constellation and an illustration, go to Christine Kronberg's Volans. For another illustration, see David Haworth's Volans. © 2011 Sol Company. All Rights Reserved.